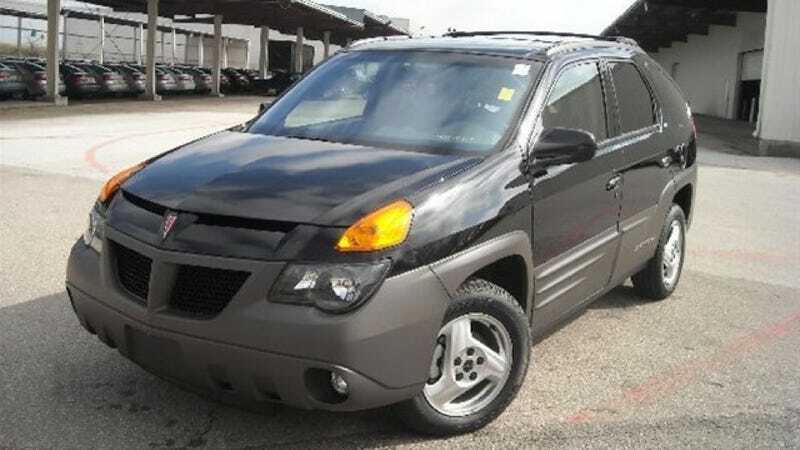 Do you regularly wake up in the morning and turn to the significant other, dog, or random stranger in bed next to you and say, "Today will be the day I own the first production Pontiac Aztek!"? If so, then today is the day you've been waiting for. Go ahead and check out this eBay auction, which features what is purportedly the first 2001 Aztek to roll off the assembly lines. Bonham Chrysler, a dealer located north of Dallas, is the one offering the car up for sale. It appears to be from this Barrett-Jackson auction at some point. As of this writing, there's about four days left in the auction, and it's currently going for about $14,300. With fewer than 8,000 miles on the clock, it's pretty cherry for its age. Buy it and you get a near-new Aztek in all its glory, including a tent that pops out of the hatch, an interior that has not stood the test of time, more body cladding than you or your family will ever need, and the feeling of confidence you get from owning a rolling symbol of General Motors' institutional arrogance and poor decision-making. Any takers out there? Come on, I know lots of people who think the Aztek got a bad rap back in the day. How bad can it really be?